My name is Philip Dallmeier, and I am the owner of A-1 Duct Cleaning and Chimney Sweep, here in Tustin, CA. I have been in the industry for 16 years and I am a second generation air duct cleaner and chimney sweep. I would like to give you some insight into the services we provide throughout southern California. A common question that I get from people is “why should I get my air ducts cleaned?” The main reason is to remove all dust and debris that has built up into the system over the years. One of the most common problems that people will encounter is that they or their kids will have irritated allergies. Also the other reason is that components inside the air duct system will become clogged with dust and it will restrict the airflow throughout the home. One can also experience unpleasant smells when the system is turned on. The next and equally important reason is that once your air ducts have reached the tipping point of having too much dust you will notice an excessive amount of dust in the home right after you have just cleaned. Another sign that your air ducts need to be cleaned is that you will notice dust streaks on the registers (vents) and walls. One can also experience a combination of all the above problems. Another common question that I receive is “how often should I clean my air ducts?” The answer to this is every four to five years with regular filter replacement. If the filter has not been changed regularly, every four to six months, then you can look at cleaning them or have them cleaned in a shorter time frame. One should also have their air ducts cleaned when moving into a new residence as it is hard to tell what the living conditions were by the previous owners. While the home may be freshly painted with new carpet the air ducts can contain the filth of all the previous owners without you even knowing it. One should also have their air ducts cleaned if the home has had a considerable amount of construction or remodeling done. The dust from dry wall, wood work and flooring can be kicked up into the air ducts. Then once the owners move in and turn their system on they will be greeted with fine white dust all over their furniture. Animal dander and fur can also be inside air ducts, I have personally opened up return air duct intakes to find an inch of animal hair. Throughout my years in the industry I have seen many companies advertising air duct cleaning for as little as $29 to clean the entire home. I would highly recommend that one avoid these companies. They use bait and switch tactics. I have had customers tell me stories of what these companies have done to them. The most common tactic is that they were told that all their air ducts had to be replaced then try to sell them on air duct replacement, but upon my inspection found that there was nothing wrong with them. A good air duct cleaning is going to cost you between $250-500, depending on the size of your home. It will take 3-8 hours to do the service. I would recommend you go online and search “duct cleaning scams” to educate yourself on choosing the right company. You may think that you are saving money but in the end you will be wasting money. It is better to just save up and have it done properly and avoid the headache that comes along with doing business with these scam companies. The most common reason one should have their dryer vent cleaned is that the build up of lint can cause fires! The second is, prolonged drying time. When a dryer vent is clogged with lint it will restrict the exhaust from the dryer “air” from blowing out of the home. What will occur is that you will notice it will take several cycles to dry even the simplest laundry articles. There is two reasons for this. Number 1, the moisture from the clothing when wet is not allowed to exhaust, therefore your clothes will heat up but the moisture will be trapped inside the dryer. Your clothes will heat up but never dry because the moisture is never allowed to escape. Number 2, most of the newer dryers have a safety sensor switch that will shut off the heat when it notices that there is a restriction in air flow. Therefore, your clothes are barely warm because the dryer is continually turning on for only a few seconds and then turning off. I have had customers tell me that it would take them four hours to dry one load of laundry. The recommended time for getting your dryer vent cleaned is roughly every two years. Another way to gauge on whether or not your dryer needs to be cleaned is that the dryer now takes longer to dry than it used to. People will have the misconception that because the dryer is older it is now taking longer to dry, this is incorrect. Dryers either work or don’t work. There is no in between. The reason a dryer gradually starts to take longer over the years is a restriction of airflow caused by buildup of lint in the dryer vent. Before you replace that old dryer it may be wise to have your dryer vent cleaned. Our third service is chimney sweep/cleaning. 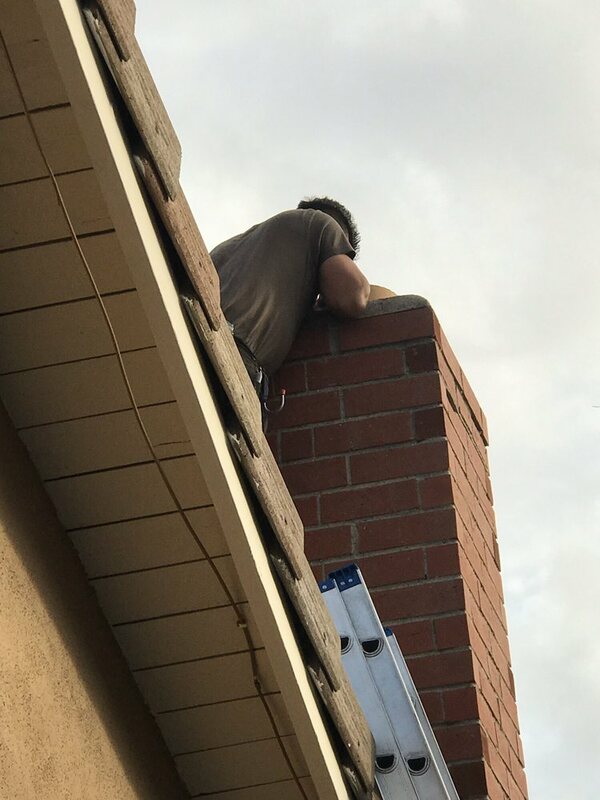 The two main reasons that one must have their chimney cleaned is number one when soot builds up in the chimney it will restrict the smoke of the fire from rising up the flue and out of the home and one will experience the smoke coming back inside the house. Number 2 , prevention of the chimney catching on fire. It may seem strange that your chimney can catch on fire but it can happen and does happen quite often. I will explain why, after many fires being burnt soot will be deposited inside the chimney after every fire. If one goes long enough the soot will eventually turn into what is called creosote. Creosote is a chimney’s enemy! It is when the soot starts to turn into a hard coal like substance that will have to be chipped off the chimney if it is allowed to build up. This is what catches on fire. If one is using their chimney regularly throughout the season then they should have their chimney cleaned every year. I hope this helps answer any questions that you may have. Feel free to always give us a call if you are in the Southern California area. Our number is (949) 940-6920.